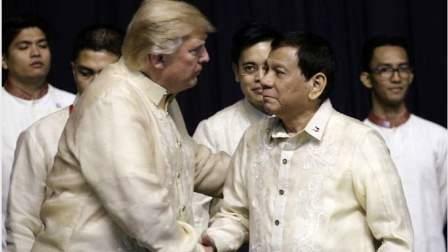 President Donald Trump will formally meet his equally bombastic Philippine counterpart, Rodrigo Duterte, on the sidelines of an international summit Monday in one of the most-anticipated moments in the US leader's first presidential trip to Asia. Both have tested the bounds of statesmanship with their foul language, devil-may-care verbal harangues against enemies and strongman tendencies. Both rose to power in an era of authoritarian, populist leaders, both have quarreled with the press and both have been condemned for making lewd remarks against women. Duterte's bloody campaign against illegal drugs includes widespread accusations of extrajudicial killings, raising global alarm from governments and rights group yet has been praised by Trump. "These two presidents both have brusque personalities. They are both tactless but, most likely, they will not clash because the twine of their intestines are identical, they will probably have a meeting of minds and even exchange strategies in solving problems." - Marius Daniel Garcia, a 34-year-old hotel guard in Manila. "The entertainment value is huge but in terms of policy impact, I would have to say, minimal ... Trump doesn't have a clear Asia policy yet. It seems to be developing. Right now, they seem to be more concerned with just giving a reassurance to Asia that they are not leaving, that's all. But concrete initiatives, nothing." - Jay Batongbacal, an associate law professor and director of the Institute for Maritime Affairs and Law of the Sea at the state-run University of the Philippines. "They're of the same color (laughs), they're both OK! They only have one color, one line of thinking. I think it's time that President Duterte came into our lives and Trump in America, and that they have one similar attitude. They might be crass when they talk but what they say has truth." - Florentino Lucido as he took pictures of his wife in front of an ASEAN sign near the summit venue. "No, of course when there are two toughies you always have this fear that there can be a confrontation, but they understand the same language, they have the same goals. In this case, both just like a better life for their people so, sometimes, two toughies become very close and end up as true friends." - Philippine Foreign Secretary Alan Peter Cayetano, when asked by reporters if "sparks" can be expected in the meeting of two leaders with very strong personalities. "Both of them feel beseeched, both of them talk about destabilization, both of them talk about overturning existing order, both of them talk about their nation first. So, Duterte, in many ways, also talks about, you know, 'make Philippines great again'. So, in that sense, there's this sense of personal solidarity and Trump relates to people who are very much like him." - Manila-based analyst Richard Heydarian.